University of Tübingen and South African researchers have revealed sophisticated design and technology developed by early humans. The bow and arrow have long been regarded as a possible indicator of culture in prehistoric times. Bows and arrows appear to have been in use for some 64,000 years, given evidence from South Africa. Until recently, their significance in human cognitive ability was unclear. Now two researchers have been able to decode the conceptual foundations of the bow and arrow. The results of the study, by Miriam Haidle of the Heidelberg Academy's ROCEEH project (sponsored by the Senckenberg Research Institute) and the University of Tübingen and Marlize Lombard of the University of Johannesburg, appear in the latest edition of the Cambridge Archaeological Journal. Using archaeological finds and ethnological parallels, the two researchers reconstructed the steps needed to make a bow and arrows. These are complimentary tools -- separate, but developed interdependently. The bow is the controlling element, while the arrows can be used more flexibly and are interchangeable. About 2.5 million years ago, humans first used tools to make other tools then to make tools assembled from different parts to make a unit with particular qualities, such as wooden spears with stone spearheads (ca. 200,000-300,000 years ago.) The bow and arrow and other complementary tool sets made it possible for prehistoric humans to greatly increase the flexibility of their reactions. There are many basic complementary tool sets: needle and thread, fishing rod and line, hammer and chisel. The bow and arrow are a particularly complex example. The reconstruction of the technique shows that no less than ten different tools are needed to manufacture a simple bow and arrows with foreshafts. 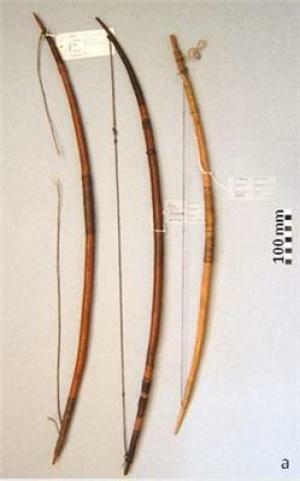 It takes 22 raw materials and three semi-finished goods (binding materials, multi-component glue) and five production phases to make a bow, and further steps to make the arrows to go with it. The study was able to show a high level of complexity in the use of tools at an early stage in the history of homo sapiens. The Heidelberg Academy of Sciences and Humanities project "The Role of Culture in Early Expansions of Humans" (ROCEEH) incorporates archaeologists, paleoanthropologists, palaeobiologists and geographers, working together to find out where the first humans arose, where they moved to in Africa and Eurasia, and why. The project covers the time between three million years ago and the last glacial maximum 20,000 years ago. The focus is on when, where, and in what form a changing climate, evolution and cultural development of early humans enabled them to expand the behavioral niche of a large primate within Africa and to find new roles outside of Africa. The University of Tübingen and the Senckenberg Research Institute in Frankfurt have been cooperating on this 20-year Heidelberg Academy project since 2008.